387203 and 387201 call at Harpenden with a service to Bedford on 16th February. 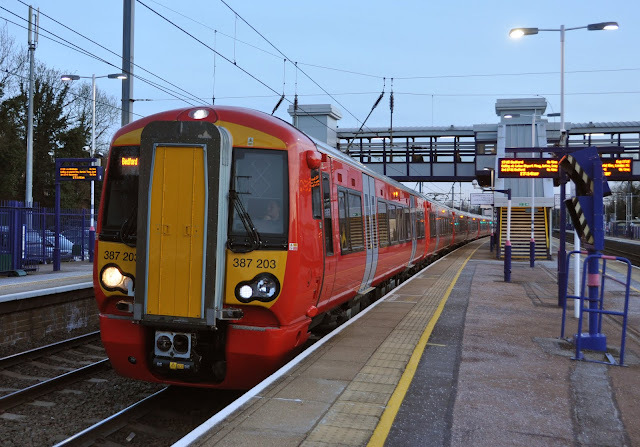 The new Gatwick Express trains had yet to enter service on airport express services from Victoria and are still awaiting the details of their branding to be applied. The trains will seldom get to use their 25kv AC capacity once in full service on the Victoria - Gatwick Airport - Brighton route. This week the new order on the Gatwick Express worked its first services on the premium London-Gatwick Airport-Brighton route with deployment of the first class 387/2 trains. The latest 'Electrostars' built by Bombadier at Derby have been delivered from late 2015 and will over the coming months replace the class 442 trains which are currently working the airport express services. Prior to their deployment on the Gatwick Express several 387/1's have seen use on Thameslink services from Bedford to Brighton, where your author was able to catch up with a pair of these brand new trains in their striking red livery. seating and red/blue colour scheme. entitle the passenger to any enhanced comfort! The 387/2's will be the second dedicated fleet of trains built for the airport express service since it commenced in 1984- the first being the class 460 Junipers which worked trains to the airport until 2012 when they were all withdrawn to be amalgamated into the South West Trains fleet as part of the class 458/5's. The most famous trains of the airport service were undoubtedly the original express fleet of class 73's hauling Mk2 coaches with a GLV driving trailor on the country end of the set. The new Electrostars will bring wi-fi and power points to the airport service and be more friendly to those with disabilities. The future of the undoubtedly more comfortable class 442 fleet is currently unknown although there are indications that Southern may keep a small number of the trains in the short-medium term.